A furry little pup is back with its owners, after a scary day near the Milwaukee River and it's all thanks to a U.S. Coast Guard officer. 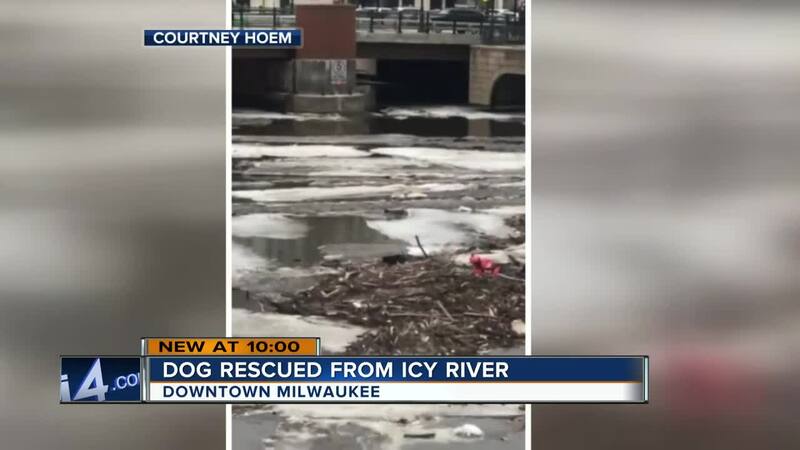 For nearly 15 minutes, people held their breath by the Wells and Kilbourn Bridges Wednesday afternoon hoping a dog stuck on a log by the Milwaukee River would make it to safety. The U.S. Coast Guard was called to the scene and Nick Ditch was ready to respond. "Got all our gear up and started heading out," Ditch said. As they paddled through the water on an inflatable boat, they ran into a problem. "The debris from all the flooding recently and all the ice was getting a little bit out of control," Ditch said. So Ditch decided to jump in and swim, pulling the boat behind him as far as he could. "I got about an arms-length away trudging through the ice and the debris, and then the dog decided that he did not want to be saved," Ditch said. It started walking around, but slipped and fell into the river, where an ice shelf pushed the dog under water. "I saw this and my adrenaline just took over," Ditch said. He hopped on the ice, punched a hole, and grabbed the dog with both hands. Police then threw him a bag to put the dog in and hoisted it back up. The dog was safe and sound, and ready to get back to its family. "It's just another thing, another day, another job I have to do and I do it willingly," Ditch said. Ditch said the dog seemed to be in good shape. He urges anyone who may find themselves in a similar situation to not try to rescue them, and instead call local authorities right away.